I hope you have all had a lovely weekend! I’ve recently re-joined a gym and the lady who runs the gym had lovely eyelashes. I asked her if they were extensions and she said and that she did them herself. She told me she got them from a local salon supplies shop and I thought I’d give them a go. I personally have paid £40 to try lash extensions from a salon, I thought they were very expensive but thought they’d be worth it for going on holiday last year. How wrong I was… within two days the majority of them had fallen off, I may as well have thrown my money away, and ended up wearing strip falsies anyway. 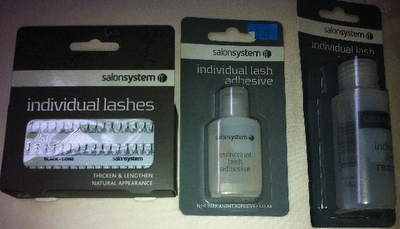 So I went to the salon supplied shop and bought the lashes, the glue and the remover. For the three items it cost me just under £12 – clearly a lot less than a salon. As you can see ladies, these lashes are VERY long! I wear glasses so they are a little annoying. There seemed to be only one size available in the shop so I just picked up a box. I did trim one of the middle ones as they just looked stupid. I wore them out for dinner last night with mascara on and they did look nice. On my right eye I must have applied too much glue to one of the corner lashes and when it had thoroughly dried, it was scratching my eyelid so I used the remover to take them all off. I did like them and thought they were worth the money, however, to achieve a more natural look I thought it best I buy some different sizes. I happened to go through Boots today and seen that Eyelure do a set with short, medium and long, so I am going to give these a go next week! If you have the patience girls, I’d recommend you just do them yourself, it really isn’t worth wasting the money at a salon! These days I've been thinking about buying false lashes.